I love the second one the most. i got those in my email. they look so cute especially the picture of the cat and the dog. i love 'em! I've seen these pictures before also. They never fail to make me smile. The little kitty under the dog's ear is so precious and joyful. Thanks Corry! Hey girl. Long time no see! I hope things are going better. I am grateful they brought a smile on your face:-) You are more then welcome. Yeah, aren't they cute? I love them. G'day Corry, I've answered your question on my blog in the comments section! Love those piccies by the way! An I love your art-work. It is gorgeous. Great pics, Correy! I love the second one! Good to know you were doing better. I keep praying for you and your mom. I've never saw the pic's before. The spiritual application was, how shall we say, fitting. Corry, you are such a good encourager. Love the photos, and really like the captions. Hi Corry!! :) The top pix reminded me of the recent story of the hamster that befriend the snake. Did you read about that? The pixs were unreal. The snake wouldn't eat his dinner! He wanted a buddy! Thanks, girl. I hope you are having a good time. I too thought it was fitting. There were more pics in that e-mail then just these. I might use some more another time. Good to see you! I hope you are doing well. Kinda foggy here today but they predict a nice weekend. Have a blessed weekend Pat! No I haven't read that but would love to. That top pic could have been taken from our pets. 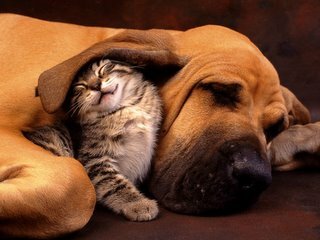 The dog and the cat play with and love on eachother and keep eachother company! It's so cute to watch! Have a great weekend, dear sister! OH! SOOOOOO CUTE! 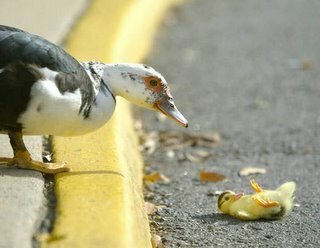 I love the little duckling! 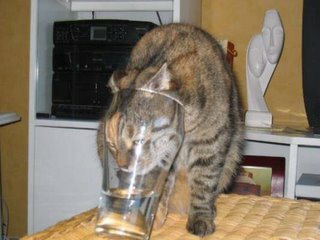 And that cat in the drink is hilarious....oh and look at how snuggly the kitten looks in the ear flap of the dog! That is so sweet. Haha, I love your enthousiasm! It's contagious.